I served this Fiesta Rice with the Taco Chicken from yesterday. I had a can of Campbell's Fiesta Nacho Cheese soup in the pantry, so I decided to use it to make this rice. We love this rice recipe. 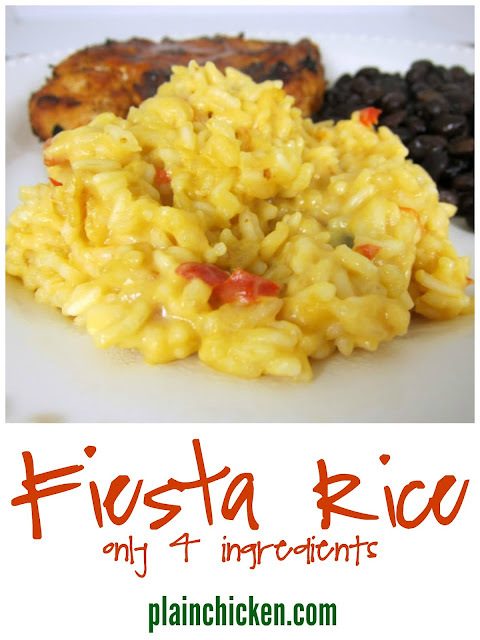 The rice comes out tender and creamy - similar to a risotto. The Fiesta Nacho Cheese soup gave the rice just the right amount of Tex-Mex flare to complement the chicken. This is a fix it and forget it recipe. Just mix up the soup, liquid and rice and pop it in the oven. The rice cooked while Chicken Legs grilled the chicken and dinner was on the table in no time. I love these kind of meals. Combine all ingredients and pour into a 9x9 pan. Cover with foil. Bake for 30-35 minutes or until the rice is tender. Stir rice before serving. Well how easy is that. I'll have to grab a can of that soup next time I'm at the store. This sounds wonderful! I'm going to make it with your bubble up enchiladas. Think I could make the rice in the crock pot? Thanks! Very easy & very good. Next time I will try it with regular cheddar cheese soup & maybe add some chopped up chicken. Thanks. So I looked at 3 stores and couldn't find the Fiesta Nacho Cheese Campbell's soup (weird, right?) so I used Progresso 3 Cheese cooking sauce and it turned out good!